Cochin is the famous Honeymoon Destinations in India Enjoy your Honeymoon in Cochin or Kochi, also known as the 'Queen of the Arabian Sea'. Important commercial center of the South India since the ancient days, Honeymoon in Cochin will enthrall you with beguiling backwaters, bewitching beaches, swaying palms, serene islands, cool breeze, mesmerizing sunrise and golden sunset. 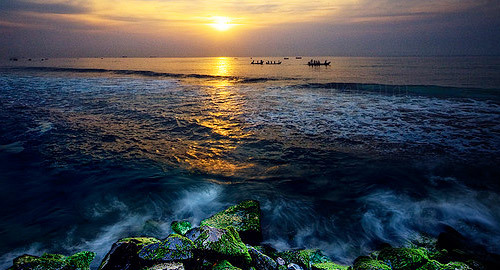 Discover the happy co-existence of the past with the present on Honeymoon in Cochin. There are several tourist attractions to see in Cochin. Take your own time in visiting the Bastion Bungalow, Bishop's House, Bolghatty Island, Cherai Beach, Chinese Fishing Nets, Cochin Club, David Hall, Delta Study, Dutch Cemetery, Fort Immanuel, Fort Kochi, Jewish Synagogue, Jew Town, Koder House, Loafer's Corner/ Princess Street, Mattancherry Palace or Dutch Palace, Old Harbour House, Parade Ground, Pierce Leslie Bungalow, Santa Cruz Basilica, St. Francis Church, Thakur House, United Club, Vasco da Gama Square, Vasco House, VOC Gate and Willington Island on Honeymoon in Cochin. Honeymoon in Cochin Explore the nearby regions of the city on Honeymoon in Cochin. You can visit the Athirapally, Bhoothathankettu, Chendamangalam, Edapally, Guruvayoor, Hill Palace Museum, Kaladi, Kumarakom, Madhavan Nayar Foundation, Malayatoor, Munnar, Parishath Thampuram Museum, Parur, Periyar Wildlife Sanctuary, Santhagopala-Krishnaswamy Temple, Shri Krishna Temple, Thattekkadu Bird Sanctuary, Thripunithura and Vamanamoorthy Temple.